In this era of increased stock market volatility, a dividend focused approach can give peace of mind and likely a better chance at above average returns. The group of stocks called Dividend Aristocrats provide a good starting place from which to build and income focused stock portfolio. Invest in the S&P 500 Dividend Aristocrats ETF (NYSE: NOBL). Over the last 15 years, this ETF has outperformed. Look for the Aristocrats with the highest yields. The average yield is about 2.6%, but there is a significant number of stocks in the group with yields well above 3%. Dividend income can be reinvested to propel portfolio growth or used as income to pay for expenses and lifestyle events. Focus on dividend growth. Owning shares of companies that grow dividends at a higher rate than their peers is a proven strategy for long-term total returns that outpace the overall market. This will take some digging, looking at the dividend track records of each of the 50 or so Dividend Aristocrats. Invest for dividend safety by picking those Aristocrats that payout the lowest percentage of net income as dividends. A low payout ratio also ensures a company will continue to grow the dividend even if profit growth flattens for a period of time. Again, this requires looking at each stock on the list. This time I want to highlight the highest yield stocks on the Dividend Aristocrats list. As noted above, high yields produce attractive real cash flow that can be used as income or to reinvest for more dividend growth. Here are the current highest yielding five stocks from the group. 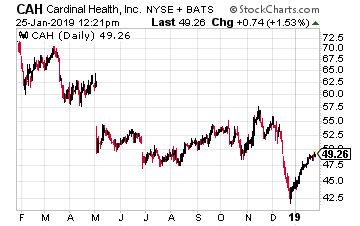 Cardinal Health Inc. (NYSE: CAH) is distributor of pharmaceutical and medical products to the health care industry. This company announces higher dividends in May, with the new rate starting with the July dividend payment. The shares yield 3.9%, and while the dividend increased by 3% last year, the five year average growth rate is 10%. 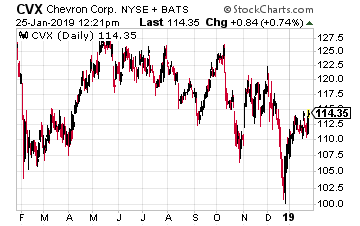 Integrated energy producer Chevron Corp. (NYSE: CVX) currently carries a yield right at 4.0%. The company should announce a new, higher dividend at the end of January for payment in March. 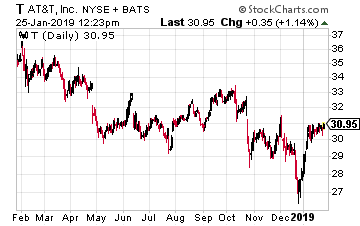 Average dividend growth from CVX has been about 3% per year. 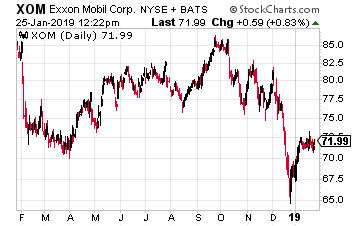 ExxonMobil (NYSE: XOM) is another integrated energy company that makes the top five yields of Dividend Aristocrats. Current yield is 4.6%. Exxon announces a new dividend rate in April each year, with the payment coming in June. Average dividend growth for the last five years has been 5.6% per year. 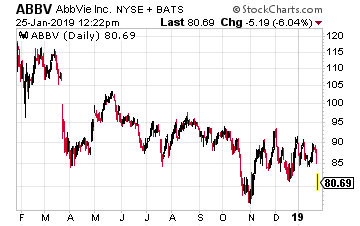 Large cap drug developer and producer AbbVie Inc (NYSE: ABBV) currently yields 4.8%. The company declares a new dividend rate in December for the February payment. The next dividend will be 11.5% higher than the rate paid in 2018. Historical average five year dividend growth rate is 18%. Telecommunications services provider AT&T (NYSE: T) currently yields 6.6%. This is the highest yield in the Aristocrats list. The company increases its dividend each year in December, with the new rate starting in February of the following year. You can expect dividend growth of about 2% per year.